Empowering young women is the focus of an artist residency program partnership between the University of Tasmania and Jansz Tasmania. The Jansz Women, Art and Business Artist Residency was recently awarded to Launceston painter Anna Van Stralen, who has an impressive CV with several solo exhibitions locally and interstate. The Bachelor of Contemporary Art with Honours (First Class) graduate developed an interest in landscape and structure through her time at the University of Tasmania’s School of Visual and Performing Arts in Inveresk. She has worked as a casual lecturer in painting and drawing at the School of Creative Arts and is currently a UTAS PhD candidate in Creative Philosophy. Ms Van Stralen said she is looking forward to working with and inspiring young women from regional high schools including Port Dalrymple, Lilydale District and Scottsdale. “It’s an honour to receive this residency. It’s good experience going through the process and I’m always aware that there’s a lot of talented people out there, so to receive this is lovely and encouraging,” she said. “I’d like to use the stunning Jansz Tasmania location as a starting point to begin meaningful explorations into the challenges and opportunities involving young women in the business and professional sphere. Ms Van Stralen said she developed an interest in landscape and structure that integrate to support contemporary Tasmanian life by focussing on the contentious or banal spaces, which exist on the fringes of suburban and industrial space. “By using sites grounded in my own domestic sphere, I’m able to investigate the collisions, layers and impacts which exist at the edges of the human habitation,” she said. The University of Tasmania’s Director, Centre for Cultural Value Dr Kim Lehman said the Artist Residency program was aimed at encouraging young women from regional schools to consider the potential of learning, creating and understanding art within a supportive environment. He said Jansz Tasmania had a particular interest in promoting the role of women in business, with women filling all three senior roles in the company: the vineyard manager, the winemaker and the wine room manager. “Jansz Tasmania shows leadership in supporting women in roles still seen as non-traditional, in their case having positions of senior responsibility in the wine industry,” Dr Lehman said. Dr Lehman said the selection panel felt that Ms Van Stralen’s keen interest in the Tasmanian landscape, as well her exploration of “guardianship” and childhood in precarious or changeable environments made her an ideal artist for the residency. “It was also clear to us that Anna was well suited to participate in a residency that aims to encourage young women, as she has been a group leader in the Hope Discovery Kids program, and an art and piano teacher during studio lessons,” Dr Lehman said. The residency will run from October 22 until November 16 and will see Ms Van Stralen live and work for one week at Jansz Tasmania Vineyard, Pipers Brook, followed by three weeks at her home/studio or the University of Tasmania’s Gorge Cottage at Inveresk. 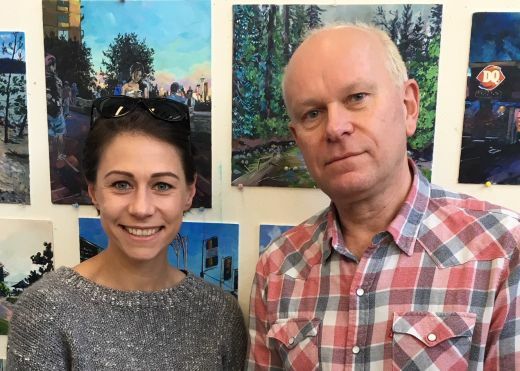 The residency will culminate in an exhibition of both the students’ and the artist’s work at the University of Tasmania’s Academy Gallery, Inveresk. Photo: The University of Tasmania’s Director, Centre for Cultural Value Dr Kim Lehman (right) with artist Anna Val Stralen, who was awarded the Jansz Women, Art and Business Artist Residency recently.